Núñez-Andrés, M.A., Buill, F., Costa-Jover, A., Puche, J. 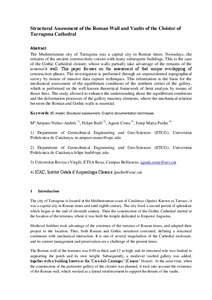 Structural assessment of the Roman wall and vaults of the cloister of Tarragona Cathedral. "Journal of building engineering", 2017, vol. 13, p. 77-86.